The Hult Prize is a global business case competition that challenges today’s young leaders to think beyond profit to consider people and the planet, addressing the world’s most complex problems through a lens of social change. Out of the 100,000 teams that applied for the Hult Prize Challenge this year, there is only one winning team that takes home the $1M seed investment to be put towards launching their idea. 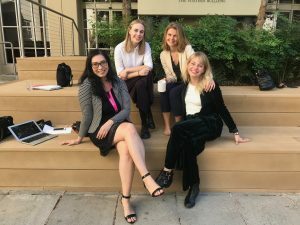 Our Hult Prize journey started in October 2017 when the four of us were in our first year of our Master of Design in Strategic Foresight and Innovation, and were selected to work together on a group project for our Human Factors and Business and Design Thinking courses. In these courses, we had the opportunity to develop design interventions around a complex problem of our choosing. We chose a topic—food waste—that would allow us to align with Hult’s 2018 energy innovation challenge. Throughout that semester, we learned so much not only about tackling a wicked problem in a human-centred way, but also about working in an interdisciplinary team. Our deep understanding of the food waste issue started with a lot of research, which, among many things, brought us to Detroit: a city that struggles with food security, but where a lot of innovation around food waste is currently taking place. What better way to ground our understanding of the food waste issue than to go there ourselves? We returned from Detroit just before the December break and pitched to the OCAD Hult campus competition with an entirely different solution from the one we had originally set out with. Being explicit about what we now knew we wanted from our innovation and how that might fit within Hult criteria had led us to a solution we believed could affect system-level transformation while fostering community autonomy and food sovereignty. Our team found out we had been selected to participate in the Melbourne Regional Finals when we returned to school in January. It was a competition on the other side of the planet and we didn’t know how we would get there or fund it. But, we knew we wanted to go. We felt not only that Hult would be an amazing opportunity to meet students from around the world working on social innovation projects, but that we owed it to ourselves to put our team values and dynamics to the test. With some incredibly generous support from OCAD’s President’s Office, the Office for Graduate Studies, and the SFI program, we travelled all the way to Australia to represent the University. Australia was, of course, a trip to remember. Yes, we got to revel in summer in the midst of Toronto winter, but importantly, we had the opportunity to work harder on something than any of us had in a long time. We crafted our trip as a sort of working retreat, parking ourselves at coffee shops for eight hours at a time, seeking Wifi wherever we could find it, Skyping advisors and practicing pitches in hallways and courtyards, getting access to local university working spaces to get our hands on some whiteboards, dreaming of our pitch, working through meals, brainstorming and writing and editing. By our orientation day in Melbourne, we were ready. Getting away to focus solely on this project had allowed us the time and mental freedom to dedicate all of our energy toward making something we were proud of. We were proud of the idea, of the narrative we had built to communicate it, and of what we knew would make us stand out in a competition of twenty-five impressive international teams. As OCAD U MDes Strategic Foresight and Innovation students, we knew our way of thinking about wicked problems was different than most traditional MBA or engineering approaches. We had the opportunity to listen to so many great pitches and proposed innovations throughout the Hult weekend, but our way of framing a problem space and allowing a human-centred solution to emerge felt uniquely ours. “The Hult Prize Competition is an exciting opportunity for our students to further develop their practical skills, and explore how to create positive social change on a global scale.” Dr. Michele Mastroeni, Graduate Program Director, Strategic Foresight & Innovation, OCAD University. We didn’t win a million dollars, but winning the “prize” would have always been a bonus for us, not the primary goal. We wanted to learn how to work with each other and work really hard on something we believed in. We wanted to travel to an international competition and pitch something that aligned with our values. We wanted to pitch something we felt we had worked as hard as we could on. We wanted to dedicate our time and energy and what we’ve been learning at OCAD to real life problem solving - to problems with real impact around the world. So for the four of us, that was winning. Part of what Hult gave us was the knowledge that we can work well with each other on critical, meaningful work. Whether we pitch to other innovation or business competitions or work together at other points in our lives, Hult has given us new confidence in our own ability to design for social change. We truly believe that any students who want to see how the processes and tools they’re learning can be applied outside of school work should consider applying to Hult. We invite any interested students who want to hear more about our experience or are thinking about the Hult prize to connect with us by emailing 3165781@student.ocadu.ca.